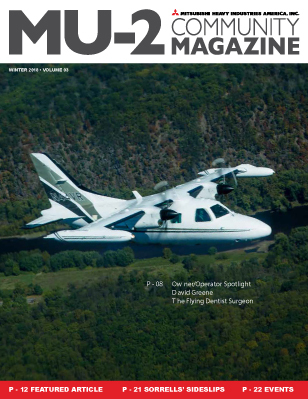 The MU-2 Community Magazine is a digitally distributed quarterly publication that includes articles on current MU-2 information and news related to the MU-2 Aircraft. The magazine features stories on current MU-2 Owners and Pilots that fly this popular high performance airplane. Whether you're an MU-2 Community Member, a person of the media researching the MU-2, a prospective purchaser or an interested party, the MU-2 Community Magazine is your resource for the latest MU-2 information. Or, enroll in an MU-2 Community Membership to receive a free subscription.